Why did you decide to organise an event for National Writing Day? I became aware of National Writing Day in the Media, and I thought it would be a great opportunity to organise a workshop. I know that there are always writers who are always looking for opportunities to attend workshops or even just meet up with other writers. 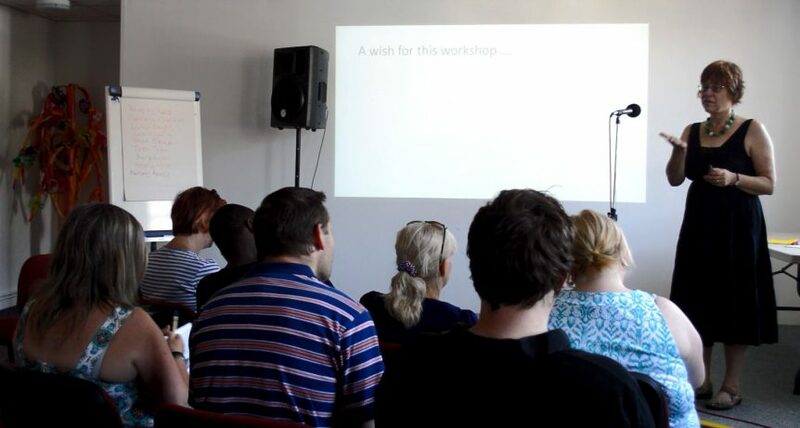 CAP has an ideal space for workshops, and can accommodate a large group of people comfortably. One of the key ideas for National Writing Day was that “everyone has a story in them” as well as encouraging young people to write. I thought that fitted well with what Community Arts Partnership does; we run the Poetry in Motion Project in schools and in communities so we cover all bases, as did the themes of this National Writing day. It is worth saying that June 27th isn’t the best day for schools as many students have finished up by then, but we aimed to get young people along, and were glad to have a talented poet, Anesu Mtowa, in attendance. Did you have to contact the organisers, First Story – the national charity – which facilitates National Writing day? I did contact them and they were very happy that we were organising an event. They put it up on their website. It was one of only two events in Northern Ireland. How was the event facilitated? There were individual and group activities. We started with a group name poem, and ended with a group poem, which we put together from individual lines from each of the participants. I think the poem turned out very well! I gave a series of prompts for writing. The National Writing Day organiser suggested that we try out a 7 minute exercise, writing around the theme of “when you feel most free,” and we tried this out. It worked really well, and produced some great pieces of writing. Along with the prompts, we also offered participants the chance to take advantage of the space that the Arts Resource Centre has, and move into one of the side rooms and work on their own writing. We didn’t offer the opportunity to have work subject to critique. For some people that can be very intimidating, especially in a large group of people whom they don’t know, and we wanted a relaxed and inclusive event. However, one writer asked for feedback, which she found useful. Was there anything that surprised you about the event? The enthusiasm with which everyone participated, on a hot day, in a very big group! It can be very intimidating to write and read your work in a large group, most of whom you don’t know, but this didn’t seem to inhibit most people. The event was very well attended – there were 26 people there; it was a diverse group with people from different backgrounds and countries and experiences of writing. We will certainly be organising an event for National Writing Day in the future. A group poem was produced by participants. I feel as if I have to write. ground of any native soil. There’s a shrink at the end of my pen. that I had thought were lost forever. and the nectar yields to my probing. Are birds really free to fly? Pelting rain, tempestuous wind, scorching winds don’t matter. Freedom to walk or maybe even run. Yet silent; uninterrupted thoughts or no thoughts at all. but I will get it right in Spring’s blossom. don’t look the same anymore. It’s not just the angels who’ve got wings.